Remember back in the summer I did a biothon in support of Frontenac Bird Studies? I wrote one post for it, but I never did get around to returning to the rest. And since I had selected and edited 48 photos from it, that left quite a few photos unused. I thought I’d revisit some of these over the winter. Here’s the first, and possibly my favourite, of the outstanding photos. Dan brought me this guy back from a hike he and the other participants had gone on; it’d been in one of my moth containers for a little bit, so it got a bit rubbed up. 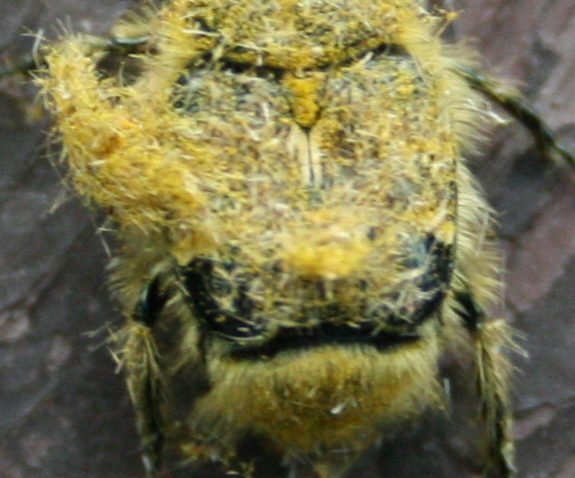 But it was still pretty clear to see that this was a FUZZY YELLOW BEETLE. Yes, it was just that cool that it requires all-caps. As always, my fabulous Kaufman Field Guide to Insects (go buy a copy if you don’t already own one!) provided me with its ID. It’s a bumble bee scarab, family Glaphyridae. There’s only one genus in this family found in North America, Lichnanthe, containing eight species. 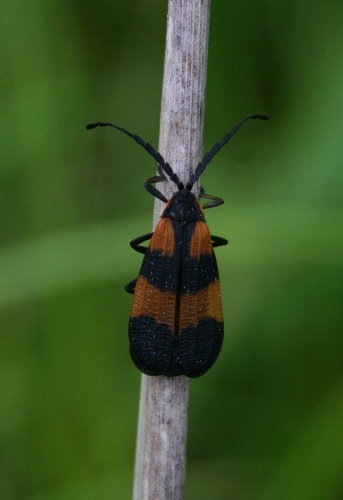 The common eastern species on BugGuide.net is Lichnanthe vulpina, which goes by the common name Cranberry Root Grub for its larvae’s habit of feeding on – surprise – cranberry roots. BugGuide says it’s primarily in eastern coastal states, but we do have cranberry around here, too, so I don’t know. Adults seem to be bumblebee mimics and visit flowers during the day. I can’t find much other info on it. Another beetle! I’ve got at least half a dozen beetles to share, but I’ll stick to these two for this post. This one’s much easier to figure out: it’s a net-winged beetle, family Lycidae, by the interesting pattern of raised veins on the wings; and it’s Calopteron discrepens by the way the vertical black bar joining the upper black band to the thorax widens as it reaches the thorax (another lookalike, C. reticulatum, remains the same width). There are five species in this genus, all restricted to the north and east. The KGI suggests that some members of this family feed on honeydew from aphids, though I don’t know if it’s true for this species. Other species seem to feed on nectar from flowers. Another species, C. terminale, lacks the upper black band. There’s a species of moth, the Black-and-yellow Lichen Moth, Lycomorpha pholus, that looks nearly identical except that it’s wings are smooth, lacking the raised veins, and its antennae don’t have the saw-teeth. And, y’know, it’s a moth, not a beetle. :) The black and orange patterning of these beetles is probably aposematic (warning predators that they’re distasteful or toxic), in which case the moth would benefit through mimicry. 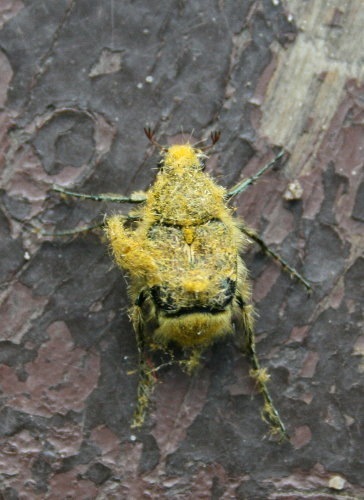 I’ve never seen a fuzzy yellow beetle before! That is pretty cool! I don’t suppose you know if they live in BC or if they’re just in the Ontario area. I gather there’re a few west coast species, Jacqui, but I couldn’t say if any make it up to BC. My guess would be probably. Awesome beetles & moth! We love your blog and are so excited for your visit to the Columbus, Ohio area. We enjoyed chatting yesterday too. Best to you on this Winter Solstice! Thanks, Jennifer! I enjoyed talking with you all, too, and am very excited to come out and meet everyone! Hmm, I’ll have to venture that the first beetle is actually another genus of scarabs, Trichiotinus. The yellow fuzz is probably debris of some sort (perhaps moth scales). Thanks for the suggestion, Ted. It does seem to have that shape, eh? I hadn’t considered debris, I’d been so taken by the FUZZY YELLOW. It wouldn’t be moth scales because they don’t rub off in that quantity in my jars (which are pretty clean), and I don’t catch any moths that colour, besides. I’m pretty sure Dan found it already covered in yellow fuzz. The crop photo helps, and it’s definitely Trichiotinus. I agree there is some pollen mixed in, but the bulk of the hairy fuzz is something else – what I don’t know. Thanks, Ted! I’ve updated the post to reflect your correction. wow……….. i love nature too! it’s mazeing how many things you’ve found….! 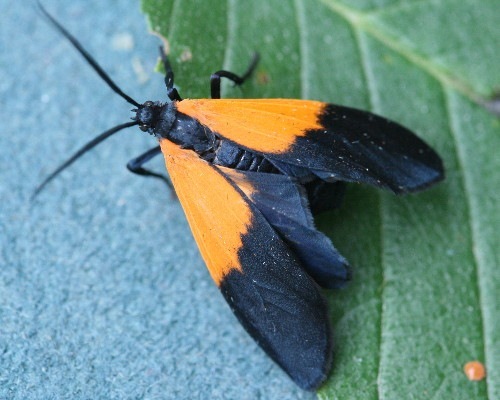 I saw a bug similar with black wings and orange tips. I have picture and would like to know what it is and if it’s friend or foe.